Before you separate you will find it very useful to draw up a budget for yourself and your family, detailing all income and spending you will make after your divorce. This budget will be a variation on your current budget, but with alterations made to account for changes such as living alone, a new home or becoming a single parent. If you are separating it is vital that you draw up a cash flow statement detailing all your current income and expenditure. 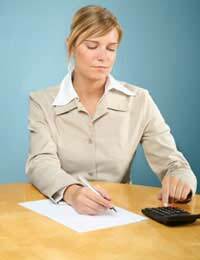 You will also need to write up a balance sheet showing your current financial situation. The court requires these documents as part of the divorce procedure. They are also among the first things a solicitor will ask to see. Read our article Creating a Divorce Budget which explains how to draw up the relevant documents. As with the current cash flow statement you present to a court, your budget plan should cover an entire year's earning and spending. Firstly, list all income you expect to receive, including salary, bonus, investments, benefits or tax credits and any maintenance payments from your partner. For an explanation of benefits available read our article Welfare Benefits. For details on maintenance payments, read Child Support. After you have listed all your income, you should write out all your projected expenses. You may find it useful to write out a separate sheet covering the divorce process, including legal fees, moving home and other one-off expenses. Expenses should be divided into three categories. Firstly, fixed outflows such as mortgage payments, utility bills, taxes and debts. Secondly, variable costs like food, travel, clothing, child care and holidays. Thirdly, any savings and investment payments, including pensions, ISAs and any emergency savings. You may find there are discrepancies between your projected spending and the reality. Remember to list all your outgoings. Include items such as haircuts and newspapers, any decorating, or quarterly and annual bills. Once you have calculated all your projected incomings and outgoings, you should add the sub-totals of the three outgoings together to make 'Total Outgoings'. Finally, subtract your 'Total Outgoings' from your 'Total Income' to give the final 'Balance' of your year's earning and spending. To minimise the chance of discrepancies between the figures arrived at in your budget and how much you will actually have in the bank, ask a family member or friend to check through it for you. If you are having trouble putting a post-divorce budget together, remember that you should have completed a current cash flow statement first. If you cannot think of the items that need to be included, or do not know what your spending is, there is one piece of advice that any financial guru will offer: you must audit yourself. Auditing means that for one month you carry a pen and notepad and write down every item you spend money on. You will probably find all sorts of small items adding up. Carrying out an exercise like this is very useful, and will get you into the habit of calculating as you go along. What Will Happen to Your Pension?